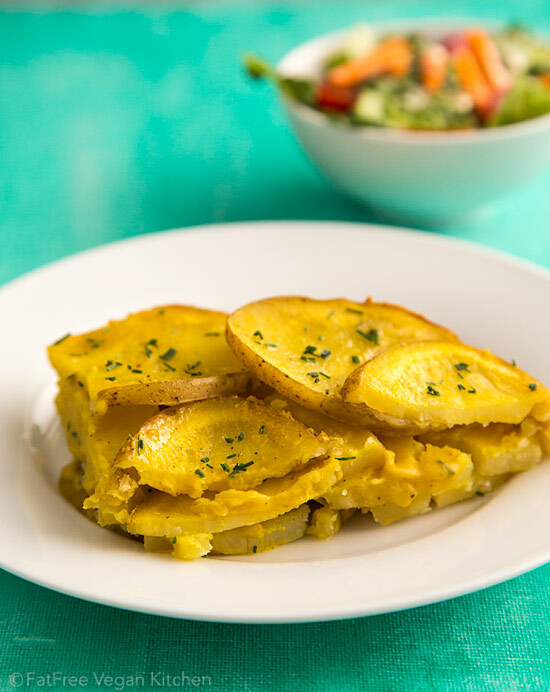 These vegan scalloped potatoes are made with a creamy, cheesy sauce thickened with chickpeas and containing no flour, starch, gluten, or soy. I almost let January slip away without a blog post. Christmas vacation for me extended from December 19, when my daughter E came home from college, until January 23, when she went back. During that time, I did a lot of cooking but absolutely no creating of new recipes because I was busy making E all of her old favorites. Apparently, even with a college dining hall with a dedicated vegan station, the food choices get old, and she came home craving home cooking. I was prepared for her to ask for lasagna, pasta with white sauce, and macaroni and cheese, but I wasn’t expecting her to want so many mashed potatoes. I made them for our substitute “Thanksgiving meal” with baked tofu and pumpkin cheesecake and again the night before she flew back to school–she ate the leftovers in the car on the way to the airport, determined to enjoy them right up until the last minute. Whatever mistakes I’ve made as a parent, instilling an unhealthy fear of carbs is not one of them! I kept intending to make vegan scalloped potatoes while she was here, and this recipe was brewing in the back of my mind for a few weeks, but any time I suggested it, E preferred mashed. So it wasn’t until today that I finally got around to trying out my idea for a scalloped potato dish with a sauce made from chickpeas and no starch or flour as thickener. Actually, I’ve been making the sauce for a couple of months now, heating it on the stove and serving it over baked potatoes, so putting it all into a casserole dish together is really only being practical. It saves me from having to bake the potatoes and sauce separately and dirtying a saucepan. It’s probably the easiest cheesy sauce I’ve ever made, but it’s not highly seasoned, so if you want to kick it up a notch or two, add some hot smoked paprika or chipotle powder. You can leave the skins on the potatoes if you like, which makes this casserole come together much more quickly. The skins do make it slightly less easy to cut and messier to eat, so for special occasions, I suggest peeling. Open a can of chickpeas. Pour the liquid into a 2-cup measuring cup and add enough non-dairy milk to reach the 1 1/2 cup mark. (If using home-cooked chickpeas, use 3/4 cup cooking liquid.) Pour into blender. Add 3/4 cup of chickpeas, nutritional yeast, garlic, salt, turmeric, and pepper. Blend on high speed until completely smooth. Add the chives without blending and set aside. Wash the potatoes and peel them if you like. Slice them about 1/4-inch thick (a mandolin speeds up the process and ensures that they are all the same thickness.) Place about a third of them overlapping to cover the bottom of the dish. Pour about 1/2 cup of the sauce over them. Add another layer and cover with another 1/2 cup of sauce. Repeat with remaining potatoes and sauce. Cover tightly with foil and bake for 45 minutes. Remove foil and bake for another 15-25 minutes, or until the potatoes are fork tender. If the top starts to brown too much, loosely cover with foil until potatoes are done. Sprinkle with additional chives and serve hot. Serving size is 1/6 of recipe. One serving is 4 points on Weight Watchers Freestyle program. I promise to be back with a new post in less than a month this time. Maybe I’ll make something for the Super Bowl. Any requests? Would this work with sweet potatoes? 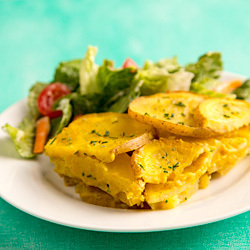 Or would a different recipe work better for a sweet potato side dish? I tried this for lunch today, thank you. “chickpea vegan cheese sauce” it is absolutely amazing and now will now be my go to vegan cheese for so many different things. I made this for a potluck dinner I have with my friends every month, no one knew it was vegan!! Thanks for the recipe. I made it for Thanksgiving yesterday and all the carnivores loved it. It was so tasty! I made this for my extended family (I’m the only one who eats vegan) over the holidays, and everyone loved it! 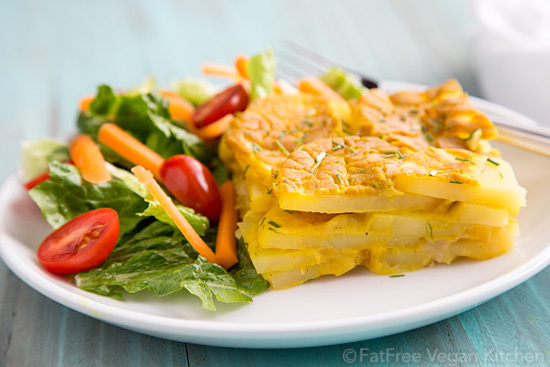 It has been hard for me to find vegan recipes that are similar in taste and texture to their non-vegan counterparts, but this recipe is WAY BETTER than traditional scalloped potatoes. It will become an addition to my entertaining menu. Thank you Susan, this recipe is delicious and is now one of my ‘go to’ dishes. Simple and quick. I made it today and served it with a leafy salad and Ann Esselstyn’s 321 dressing. Yum yum. Ok so confession- I had cooked potatoes already made but I just felt like having chips so I made the cheese sauce and heated it up with taco chips! It was still delicious- and I added one tablespoon of cumin into the sauce as well. It really made it. Thanks! I made this dish tonight and it’s my new favorite!!! I ousted the oil and lined my dish with parchment- worked out great. Thanks for such a warm, comforting recipe! Thank you for this wonderful recipe! We made a batch last night and it was terrific! We are making it again today. I can see is lots of opportunity for variations, such as adding onions or mushrooms. I bet this same sauce would be great for a vegan baked macaroni and cheese dish! Could the potatoes be replaced with cauliflower or broccoli? Use the same amount as the potatoes? Love your site. I just made your mac and cheese recipe today. Delish! Thank you! 😀 I think either would work. I would just cook them covered for 15 minutes before removing the foil. And then just play it by ear until the veggies look done and the cheese sauce is thick. Looks amazing side, most dishes like this I’ve seen are dairy heavy. But for smaller households, I wondered if the dish would be freezable after the first 45 minutes baking? I’m unsure how the ‘cream’ would react when defrost for re-baking. I think it would be all right, but I haven’t tried it so I can’t be absolutely sure. Thanks for this great recipe! I added a little more salt and onion powder and 1/4 cup raw cashews, some vegetarian chicken seasoning and cooked it and mixed it with pasta and veggies. It was so good, thanks again! I just made this for dinner. I paired it with veggie balls from High Carb Hannah. I really like this sauce. I used canned light coconut milk. It tastes fantastic! I will be able to serve this to non plant based friends and family. I really appreciate your hard work on these recipes. I can’t wait to try more! What are the dimensions for the casserole dish? About 8×8-inches. It doesn’t have to be exact, but you don’t want it spread much thinner than that. This recipe is one of the best! My daughter made this for Christmas dinner and everyone loved it (as well as my husband, who will eat nothing I cook!) Hubby even said “it’s better than boxed” which is a great compliment from him. I made the Applesauce Ginger Cake with Maple Glaze and that too was a hit. Thanks again! Thank you! This looks fantastic! As far as a request recipe, what about something chocolate????? I plan on making this yummy dish for a date night this Wednesday! What would go well with it, as a side? I will be cooking for a non-vegan who claims he has never had vegan food before, so the pressure is on to impress! Super Duper Yummy!!!!! Made it today ~ just wonderful!!! Just made the sauce as I was looking for a nut free, oil free cheese sauce. The flavor was amazing, but too runny. How can I thicken it up without messing with the flavor? Do you think tapioca flour or agar-agar would work or something else entirely? It’s runny because the potatoes help thicken it, but tapioca, potato starch, or cornstarch will thicken it. I would avoid agar.